Hey guys, sorry for this long pause. Here it is, the long-awaited brand new Toggle Mod version 9.0 works with Mini Militia version 2.2.86. How To Use & Gameplay Video. Expect new features soon, and don't forget to ping me your suggestions via the Contact-Me page. Invalid android version specified - A coding mistake. Major bug that caused app crashes, game crashes, etc. Bug that crashes only after pressing "Patch" button. - Thanks to Shashi Gaikwad for providing access to his device, and for being patience and his time, while I analyse the bugs. 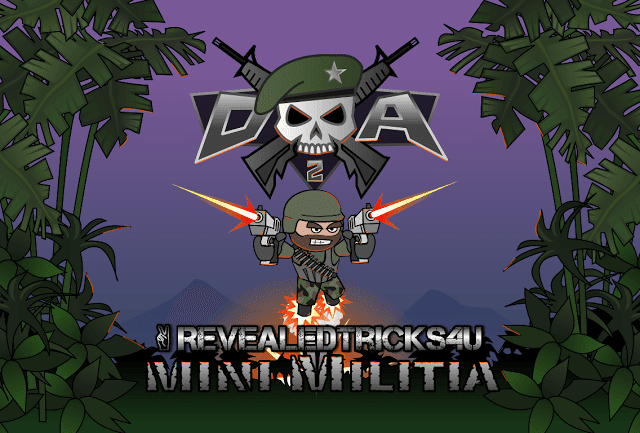 MiniMilitiaMods-UPDATED-v9.0-RevealedTricks4U.com.apk(2.58 MB) - Click on skip ad to get the download page. Happy gaming, and as always, share and subscribe via Subscription Page :D.
And, please feel free to share your opinions through the comment box. Does it work for non rooted devices? I'll release one NO-ROOT app soon. Hi shihab why the toogle mod stopped every time I opened it. My phone is lenovoA319 4.2.2 pls fix it thank u.
Hi Jazim, thanks for the appreciation. And what does this mean "Are you feeling better"? Shihab can you help me? Mini militia toogle mod is not working on my phone, all the requirements are met and still it doesn't work, when i press"patch binary and save" and launch the game and go to quick play the mods I pick didn't work, please help me.. It just crashes or no changes reflected? There are no changes reflected.. Please provide the logs from your internal memory, just zip the folder "rt4u" and send it via email. While enabling unlimited ammo,only one gun is firing(uzi+revolver)only uzi is firing.can you make the two guns working? This is not working for me as when i touch the patch binary version nothing happens, i don't see any popup . When i play there are no changes. I have nexus 5 marshmallow rooted with supersu. You should give root access whilst that operation. Make sure you've given root access. And Please provide the logs from your internal memory, just zip the folder "rt4u" and send it via email. It's right there on the top, just scroll above and download from the Downloads section. Please check the updated link, it may fix your problem. So is patching and reading process successful? Please check the updated link, it will fix your problem. Yes its patching successfully and and saving the binaries but on launching it gives error. Plus ther is no rt4u folder in my internal. The bug has been fixed. Please download the updated app from the Downloads section above. Nice suggestion, I'll add that to my schedule. It doesn't work and keep on sayin patching and nothing happens i met all the requirements including root . Please fix the issue. I'm thankful of you for working hard.